The BBC ran a full day of live radio and TV coverage on from Cox’s Bazar on Monday 15 January. The day kicked off with the announcement that the UK Government was playing a significant role in halting the spread of diphtheria within the camps by vaccinating 350,000 children between the ages of six-months and 15-years. Alongside the vaccination announcement the Today Programme aired a day in the life piece with Holly Gettings, an A&E doctor from London, who for the last three weeks has been saving the lives of those who have contracted diphtheria. Her role as part of the UK-funded Emergency Medical Team (EMT) is a vital one and she highlighted the difference the team as a whole has made to those suffering, including a four-year-old boy named Anowar who had the symptoms of diphtheria. International Development Secretary Penny Mordaunt was interviewed on the Today Programme, in her first broadcast interview since taking up the role. She thanked the British public for donating to the Disasters Emergency Committee appeal to help those who have suffered at the hands of the military. She also made it clear that the UK would not support the return of the Rohingya to Burma unless conditions were safe, voluntary and dignified. The work of the EMT to bring the diphtheria outbreak under control, and the UK’s contribution to the vaccination programme had its first TV broadcast mention during the lunchtime and World News bulletins. DFID’s very own Humanitarian Response Manager, Matt Benson was interviewed during the piece and he highlighted the crucial support the UK has provided so far. But he warned that further support will be required in the weeks and months ahead. The 6pm BBC bulletin also carried a story on the work of the EMT and the diphtheria outbreak. The piece focused on Anowar’s story as he entered the clinic displaying symptoms of diphtheria, right through to his recovery. BBC’s news website also carried a short clip of Anowar and an interview with Dr Marian Davis. In tandem with the BBC coverage we posted our own content of Anowar’s road to recovery on our social media channels. International Development Secretary Penny Mordaunt said, as she announced the UK government’s vaccination programme. It is difficult to comprehend the depth of human suffering among the hundreds and thousands of Rohingya who have fled persecution in Burma. Many have sought refuge in Bangladesh, but their plight is far from over as diphtheria, an entirely preventable disease, is claiming the lives of those who thought they had finally reached safety. 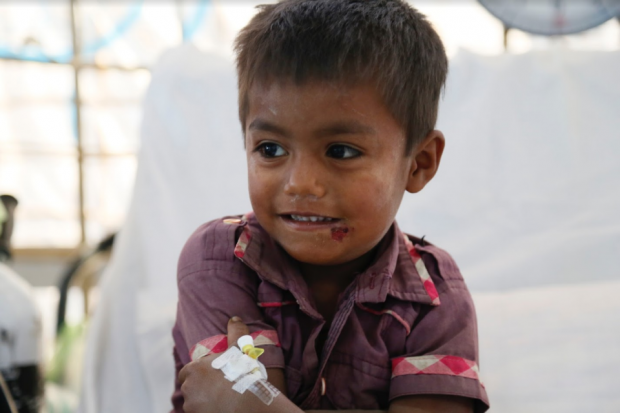 British expertise and aid is saving lives in Cox’s Bazar, preventing and treating this deadly infection, helping children like Anowar. In today’s world, no child should die from a preventable disease. The UK is giving hope and a chance to Rohingya families.